* v4. SOLD * Please send email to order. Each Scarface is unique in it's finished appearance, numbered and signed. Looks killer on a White, Black, Red, Sunburst or Tobacco Burst Stratocaster. 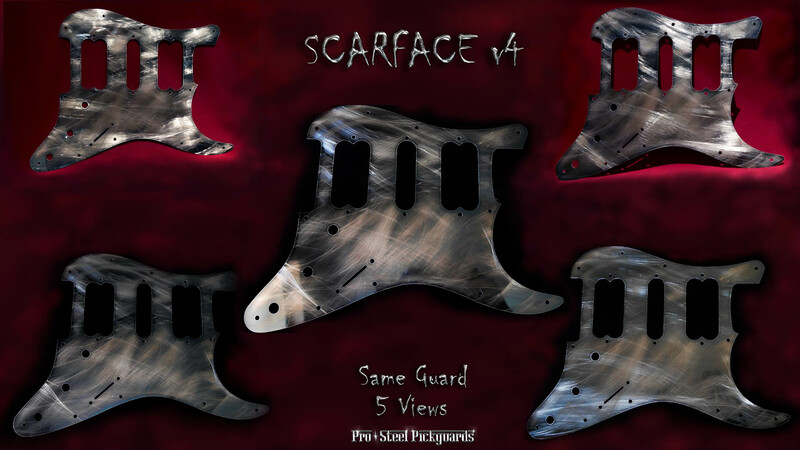 The Scarface is a hand finished special edition. Black mirror stainless steel is worked by hand to achieve a natural battled aged semi-silvery surface. Screws darkened to match guard, heat tempered. 100% non-magnetic stainless steel, corrosion free. If you need a hole for a Mini Toggle Switch, let me know. I can do this free of charge. Also works as a great noise shield. FITS - HSH Pickguard fits most genuine Fender USA & MiM HSH Strats. Or any Standard Strat SSS when neck and bridge pickups are changed for Humbuckers to HSH. Squier Strats - Will fit Squiers, with maybe 1 or 2 screw holes a little off centre. That's usually no problem, the screws supplied will easily find a hole.